This year, I'm really thankful for my life. The fact that I'm alive. The fact that I'm loved. The fact that I'm surrounded by my loved ones, in flesh and in spirit. The fact that by the end of this year, I begin a whole another phase of life, something in the making for a few years now. The fact, that I have food to put on the table. And of course, the fact that sometimes, I have food put on the table in front of me, and I stuff my face and review it! This time, it was the turn of Paranda, at Vivanta by Taj, Surajkund. This was previously Dhaba, when Vivanta was Claridges, both Surajkund as well Aurangzeb Road. Remember when I reviewed Dhaba? Now all I see lately is dhaba cuisine everywhere. Everywhere. Hotels, smaller restaurants and of course, dhabas. what I wouldn't give for REAL dhaba food, the smell of the highway dirt lingering! In one sentence, Paranda does a fairly good job; it's delicious North-Indian food, but just misses the cut for dhaba food. At Paranda, we started with a shot glass of chaach, sensitively tempered with jeera, mustard, coriander and curry leaves. This was absolute bliss! 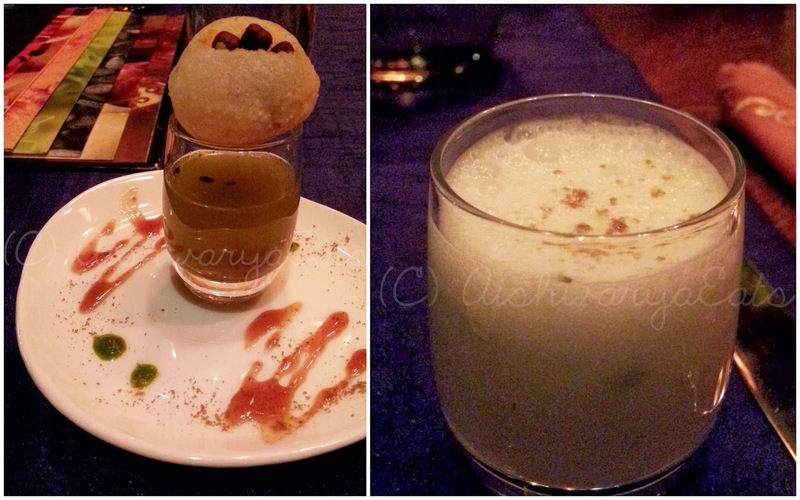 We chased that down with our amuse-bouche, a golguppa, sitting atop a shot glass of meetha pudina paani. Cool and khatta-meetha, this did a fantastic job of whetting our raging appetites. 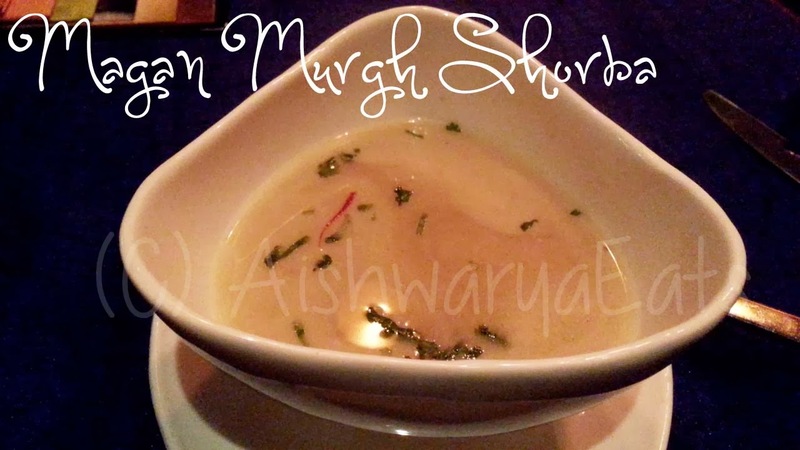 Our soup course was Magan Murgh Shorba. This had the texture of a sweet corn soup, generous on the pieces of chicken. And a few strand of saffron floating about. It was really delicious, because that's all we asked for on a cold evening. I just felt though, the saffron was a bit misplaced. 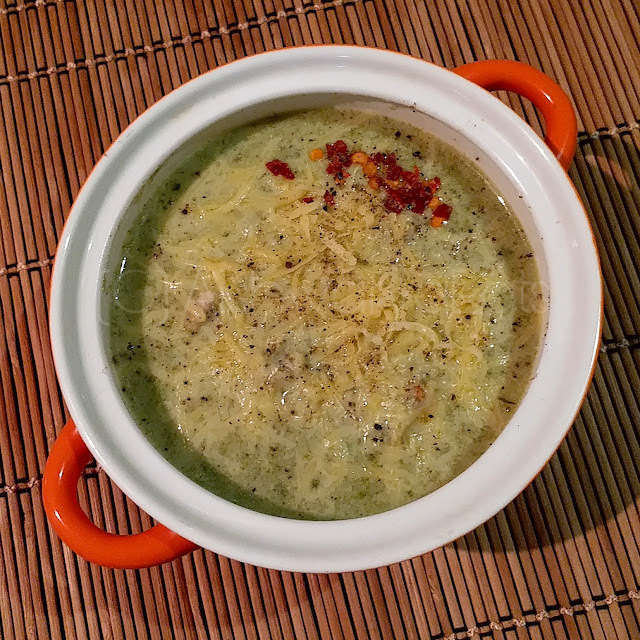 In the sense, it stood out with its own flavour, and did not tie in with the taste of the soup. We followed that up with the appetizers course, which was EASILY the star of our entire meal. Teh vegetarians were served a Punjabi Paneer Tikka (tasty, but a bit under-seasoned), a Bhuttey-Matar di Seekh (nice, quite nice) and Bhune Broccoli Aur Kale Chane ki Kebab (under-seasoned, but not bad at all). The Non-vegetarians (that would be me) were served Methi Machchi Tikka, Murgh Sunheri Shahi Tikka and a Bhutta Malai Jhinga. 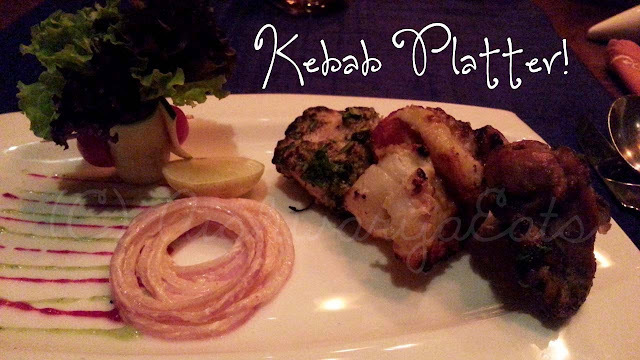 The fish tikka was tender, and really very well seasoned and pretty darned tasty. The chicken tikka was slightly tough, but oh so flavourful. But the prawn kabab, one single tiger prawn butterflied and slightly charred around the edges: explosion of flavours on my tongue. Soft enough to cut with a table knife yet crunchy enough, spicy and a subtle lemony flavour: this was the highlight of our entire meal. The main course, like many others, though well done, failed to whip up magic. 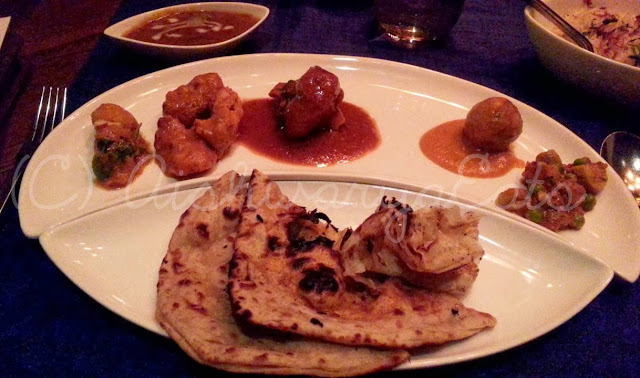 There was an array of breads like pudina paratha, lachcha paratha and the like. For the gravies, there was a Chooza Khas Makhni, indistinguishable from a butter chicken, Bhatti Aloo Shimla Mirch, Dry Fry Matar Mushroom (there needs to be more magic and imagination in the vegetarian department), Palak Kofta Makhani wala (flavourful, but the gravy failed to permeate the kofta, leaving it dry and tasteless). 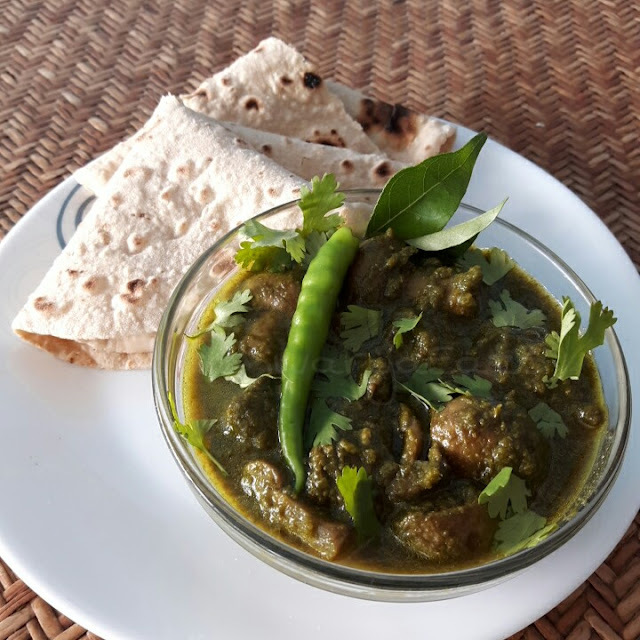 The Sood de Dhabey di Daal was, however, smooth and tasted of butter, even though it wasn't much more than a regular kaali daal. Something the parathas could totally wipe up. And the last one, Mutton Tariwala, was a delightful mutton preparation. The gravy was intensely flvourful yet light and the mutton was fall-off-the-bone tender. It went fabulously well with the breads and God knows, I was smiling ear-to-ear after that one. The desserts were a let-down though. 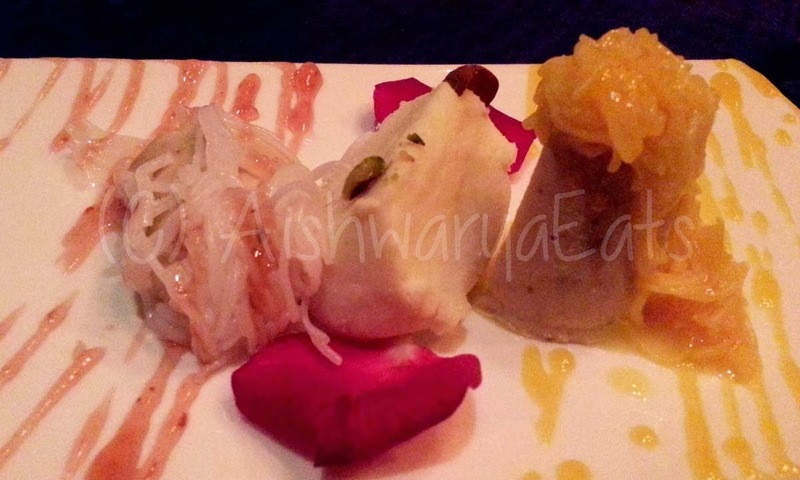 We had a Malai Chamcham, Gulab Jamun and Anjeer ki Kulfi, topped with Falooda. Honestly, Malai Chamcham is something I'll find at a CR Park sweet shop, not a restaurant at Vivanta, even though the theme is earthy. The Anjeer ki Kulfi was quite tasty, though studded with ice crystals, and hence not churned well enough. By the time the Gulab Jamun reached us, we couldn't take another sweet bite. One simple line to sum up Paranda: Has so much potential, has some very delicious food, and some very well-read and courteous staff, but has to get out of the shadow of the restaurant whose premises it presides on, and needs more imagination in the vegetarian and desserts department. But yes, an evening very well spent!